Sinus congestion caused by dust, pet dander, dust, perfume, cold weather or allergies that stimulate the sinuses causing blocked ears, a choked nose, stuffy head and painful cheek bones. An infection of the sinuses is caused when the sinus tracts or nasal passages in the facial bones become inflamed due to the presence of fungi, allergens, bacteria or dust. This will block the sinuses and cause the infection to grow. In some cases mediation will not help relieve this discomfort, but taking advantage of sinus pressure points can help to relieve discomfort. Some areas of the skin are particularly sensitive to the transmission of natural bio electric impulses throughout the body. If you stimulate these points it will cause a release of endorphins to release tension in these areas and encourage the body to function the way it should. Applying pressure to certain points is a common technique for encouraging specific organs to function more efficiently. Understanding sinus pressure symptoms and how to prevent them will help you tackle this issue head on, and acupressure is a common tool to ward off issues associated with sinus pressure such as bronchitis. Use the tips of your index fingers at a 90 degree angle from the face to apply pressure along each nostril for 4-5 minutes. This can help the sinuses to drain to help relieve pressure and congestion. Use your fingers to locate an indentation in the inner eye socket near the point where the eyebrows meet the bridge of the nose and apply pressure evenly on both sockets for 4-5 minutes. This pressure point and the one described above can be worked to let off pressure and reduce mucus congestion in a few minutes. Find the hollow under the base of the skull at the back of the head and press into it for 3-4 minutes to help release head congestion, mucus, mental stress and headaches. Pressing into the ridge on the lower portion of the eyebrows with your index finger can help to relieve symptoms associated with a sinus infection. Pushing into the cheekbone directly below the pupil can also help to relieve pain from a sinus infection. This pressure point is also associated with relieving pressure on eyes and eye fatigue. For pressure in the forehead, place the pads of the thumbs just above the nose in the center of the forehead and drag them down along the eyebrows toward the temples. Repeat this motion 10-15 times with increasing intensity. Use one hand at a time to press the fingertips into each other. 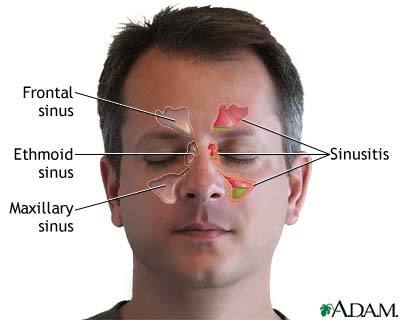 These pressure points are very sensitive and can reduce the ache of a sinus infection. Use your thumb to apply pressure to the upper edge of the elbows for 4 or 5 minutes at a time. Take the webbing between your forefinger and index finger at the highest point of the muscle and apply pressure for 4-5 minutes. Find the hollows below the point where your collarbone protrudes, which should be just outside the upper portion of the breastbone. Apply pressure here for 4-5 minutes. Keep Air Moist. Moist air keeps the sinuses lubricated so they do not become swollen and irritated. A home humidifier is particularly helpful for this. Lubricate Your Sinuses. Saline nasal spray or a hot shower will help to get moisture into the sinuses to relieve pressure. Maintain Hydration. Drinking liquids will help keep the sinuses moist from the inside out. Warm beverages such as herbal teas that contain thyme or chamomile will help to keep the sinuses moist while offering decongestant properties. Lemon or ginger tea will boost the immune system. Use Warm Compress. Placing a warm compress on your face while lying down will help to take down sinus pressure. Elevate the Head when Sleeping. Place a few pillows below your head when you go to sleep to encourage your sinuses to open and breathe. Take OTC Drugs. Nasal decongestant spray or antihistamines can help to take down stuffiness and swelling that come with a sinus infection. These remedies are designed to provide temporary relief. Licorice. Licorice root can help to stimulate the immune system to fight off a sinus infection. It also contains expectorant properties that will help to thin the sputum in your nasal cavities so it will drain more easily. Eucalyptus. Eucalyptus is commonly known for its anti-inflammatory properties. Drinking tea or inhaling steam from that contains boiled eucalyptus leaves 2-4 times a day can help to clear out the nasal passages so it is easier to breathe. You can also add eucalyptus oil to a steam treatment for similar effects. Mustard Seed. Consuming mustard seed in your food will help to clear away a sinus infection. Create a decongestant by adding a tablespoon of mustard seed powder to boiling water and placing 1-2 drops in your nostrils to clean out your nasal passages. You can also grind mustard seeds into a paste with water and flour and place this mixture on the chest to help relieve your symptoms. Ginger. Ginger extract helps to relieve pain and acts as an anti-inflammatory that can help to cure a sinus infection. Grind 1-2 teaspoons of raw ginger and consume each day or consume ginger tea to take advantage of these effects. Peppermint Oil. This is an anti-inflammatory and an expectorant that can help to clear the nasal passages and sinuses. You can add peppermint oil to steam and inhale, consume peppermint tea or place peppermint oil on the forehead to take down pressure, make it easier to breathe and reduce your overall symptoms. Cinnamon. Cinnamon has anti-inflammatory, antioxidant and antibacterial properties that can help to soothe your mucus membranes in the nasal passages. Create a cinnamon paste and apply it to your nose and head to take down pressure. However, avoid placing cinnamon directly on the skin as it is very potent and can cause allergic reactions.